Lawmakers in both parties have put forward legislation to place new restrictions on the travel of federal employees, seeking more oversight and ethical spending of taxpayer dollars. The legislation would also block funding for any travel that violates the portions of federal regulations dictating restrictions on the use of government aircraft. Several Trump administration officials have become ensnarled by various travel scandals, leading, at least in part, to the resignations of former Interior Department Secretary Ryan Zinke, former Veterans Affairs Department Secretary David Shulkin and former Environmental Protection Agency Administrator Scott Pruitt. 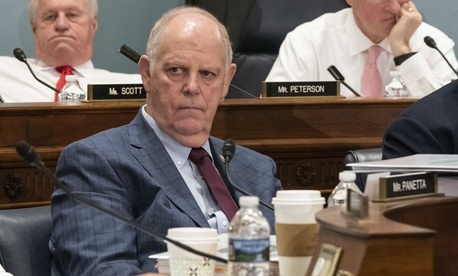 O'Halleran introduced another measure to require the Defense Department to report quarterly on presidential travel, including costs incurred by the commander in chief’s travel to properties he or his family owns or operates. Another bill, introduced by Rep. Chris Smith, R-N.J., also aims for more ethical federal employee travel. His measure (H.R. 1427) would encourage federal employees to stay in hotels that have taken action to reduce human trafficking on their premises. The General Services Administration would create a list of hotels that have taken certain steps to train their own workforces on recognizing and reporting human trafficking and require feds to prioritize staying in those facilities when traveling for work. The bipartisan measure, which was cosponsored by Rep. Carolyn Maloney, D-N.Y., would prioritize agency bookings and payments for hotels that met the human trafficking prevention standards.